I had a delightfully fun interview this morning with Imam Abdul Rauf of the so-called “Ground Zero Mosque.” About 70 minutes on the phone. He was so engaging, open, interesting and downright easy to talk to. I think our paths will cross again! I asked him the fun, easy questions like, “Where are you from?” Egypt/Kuwait. “When did you come to America?” 1965. Then bigger and broader questions like, “Do you have any regrets about starting this Cordoba Center/Park51 Mosque?” And…did the criticism hurt and feel personal? To…do you think Christians acted like Christ during this process? I also asked (against my judgement, but everyone always asks me this question): “Are you willing to stand up for the rights of Muslims in Muslim countries to convert to Christianity if they want to…and then build churches in places like Saudi Arabia?” (To which he immediately answered yes to both, and went on a long discussion about how the Qur’an explicitly states that this should be a right everyone has, and the countries like Pakistan, Afghanistan and Saudi Arabia that don’t allow that are not being true to the faith). I asked him if he supports Hamas. Without hesitation he said NO and went so far as to call them thugs and thieves. I suggested it needed a more complex and nuanced answer (like I would give), but he didn’t budge. The full answer was NO. And so much more….the juiciest parts will be left for the project that I did this for – you’ll have to wait and see on that one! “WHY do I do this?” some ask. Good question. And why do I not “call them out” and “tell them the whole truth” as one Radio interviewer said to me just yesterday…. 1. I want to treat the “outsider” with as much grace as Jesus treated the outsiders. He seldom (sometimes, but seldom) gave hard or direct answers to them. He was typically more nuanced with the “other” and harder on his disciples – and hardest on the religious types. 2. I don’t want to shut the door to future conversations. Keeping doors open is much of what I’m about in these types of discussions. 3. I want to honor him. I asked him for an hour of his very busy time – he graciously gave it to me – and so the last thing I want to do is be rough on him. May Jesus, who comes full of both Grace and Truth, give us the measure of both as we need them! Really the thing that gets me is that Jesus and the relationship we have available with him is the most personal thing we could ever have. 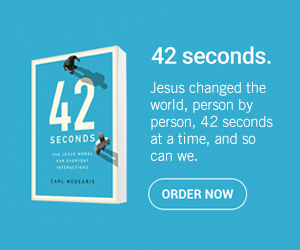 The irony within it all, (and the theology of it can be argued back and forth, but many would agree), is that in being so personal, Jesus gets the chance to make us like him. How easily we forget and take up arms for Jesus who himself has disarmed us in the secret place. What a glorious position it is to have Jesus as our only defense! My greatest hope is that, in spectrums both deeply intimate and simply practical , I would at some point be mistaken for him. I like your post Carl! Its so refreshing reading this blog. I feel slowly that my western “Christian” upbringing is becoming redeemed! Reading this post brought back my reading the book by Mazhar Mallouhi about his staying within Muslim culture and yet loving Jesus and bringing other people to the knowledge of Jesus too. I thoroughly enjoyed this post! Do we get to hear more of his thoughts on feeling crucified and how that connects to Jesus in the upcoming project? If so, I’ll enjoy hearing that. Hi Carl, I just have to ask you if you question whether you are being deceived in these interviews. I have heard various descriptions of the Islamic practice of taqiyyah, deception for the purpose of promoting Islam. What do you think?